Monel Washers, ASTM B127 Monel 400® Washers, Alloy 400 Plain Washers Dealer, Nickelvac® 400 Industrial Washers Stockists, Nicorros® 400 Square Washer Suppliers, Monel 400 Fasteners, Nickel Alloy UNS N04400 Spring Washer, Distributors of Monel Alloy 400 Dock Washers, DIN 2.4360 Monel ASME SB127 Ogee Washers in Mumbai, India. Monel Gr. 400 Star Washer Manufacturer, ASTM B127 Nickelvac® 400 Washers, ASME B18.22.1 Monel 400 Customized Washer, ISO 7089 Nicorros® 400 Washer, Monel 400 Tab Washers Wholesaler, Alloy 400 Tooth Lock Washer, DIN 125 Monel Alloy 400® Flat Washers Exporters. Renine Metalloys is a well-known stockist and trader of Monel Alloy 400 Washers, which is a solid-solution binary alloy. Monel 400 Flat Washers is often used for Chlorinated solvents, Industrial heat exchangers, Crude oil distillation towers, and so on. Monel 400 Lock Washers consists of two crystalline solids that, together, for a single new solid. Monel 400 Sealing Washers is adaptable to virtually all methods of cold fabrication. As nickel and copper are mutually soluble in all proportions, Monel 400 Split Washers is a single-phase alloy. The machinability of Monel 400 Slot Washers is difficult as it work-hardens during machining. Monel 400 Machine Washers is also used for feed water and steam generator tubing. For heavy duty construction materials, Monel 400 Star Washers provides superior quality and is able to withstand very large amounts of weight and pressure. In no event, should Monel 400 Spring Washers be heated above 2150 Degree F (1175 Degree C). 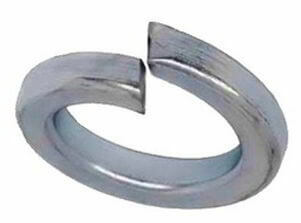 Monel 400 Wire Spring Washers has excellent resistance to stress corrosion cracking in most freshwaters. Monel 400 Flat Spring Washers may be joined by a variety of processes including gas metal-arc, gas tungsten-arc, and shielded metal-arc processes. Monel UNS N04400 Washers is as well used for marine engineering, valves, pumps, shafts, chemical and hydrocarbon processing equipment, fittings, fasteners, and heat exchangers. Heating of Nickel Alloy 400 Washers to 1000 Degree F / 1050 Degree F for 1 to 2 hours will relieve strains in either hot or cold worked products. Monel 400® Slant Washer, Nickel Alloy 400 Plate Washer Suppliers, Werkstoff No 2.4360 Monel Countersunk Washers Traders, DIN 127 Monel Alloy 400 Fender Washer, UNS N04400 Monel Lock Washers, ISO 7090 Monel 400 Hexagonal Washer, Monel 400 Bevel Washers Exporters. Monel Fasteners, Monel Washers, Monel 400 Fasteners, Monel 400 Washer, Nickelvac® 400 Washer Suppliers, Nicorros® 400 Washers Exporters, ASTM B127 Monel Alloy 400 Flat Washer, Nickel Alloy UNS N04400 Lock Washers, Monel 400® Finishing Washers, ASME SB127 Alloy 400 Bonded Sealing Washer, Nickel Alloy 400 Hillside Washers, Monel Alloy 400 Belleville Washers, UNS N04400 Monel® Industrial Washers, Monel 400 Conical Washers, DIN 2.4360 Monel Round-Mall Washers, 400 Monel® Wave Washers, Werkstoff No 2.4360 Fender Washers, Monel 400 Tooth Washer, Alloy 400 Internal Tooth Lock, Monel Alloy 400 External Tooth Lock, Monel 400® Plain Washers Exporter, ASME SB127 400 Monel Flat plain Washers, Monel 400® Square Washers Supplier, Monel 400 Dome Plain Washers, Monel 400 Countersunk Washers, Monel 400® Dock Washers, Monel 400® Ogee Washers, Nickelvac® 400 Bevel Washers Stockist, Alloy 400 USS flat washers, Nicorros® 400 SAE flat washer, B127 Monel 400 Split Lock Washers, Nickel Alloy UNS N04400 Spherical Washer, Monel 400 Spring Washer, Monel 400® Slant Washer, Monel Alloy 400® Custom Washer Stockists, Monel 400 Star Washers Stockists, ASTM B127 Monel 400 Tab Washer, Monel 400 Double Tab Washers Traders, Nickelvac® 400 one Tab Washers Dealer, Monel 400 Taper Washers, ASME SB127 Monel Grade 400 Round Washers, Nicorros® 400 Square Plate Washer, Monel 400 Dome Tooth Washer Stockholder, Monel 400® Torque Washers, Supplier of High Quality Monel Alloy 400 phenolic Washers, Manufacturer of Monel 400® split Washers Traders, Exporters of Monel 400 Special Washers, Monel 400® Hex Washers Dealer, Monel 400 Customized Washer Stockholders, DIN Standard Monel 400 Washers, ANSI Standard Monel 400 Washer, BS Standard Monel 400® Washers, ISI Standard Monel Alloy 400 Washer, ISO Standard Monel 400 Washers. Houston, Dubai, Ahvaz, Doha, Aberdeen, Kolkata, Port-of-Spain, Bogota, Riyadh, Pune, Nashik, Chandigarh, Secunderabad, Algiers, Noida, Busan, Surat, Ho Chi Minh City, Al Khobar, La Victoria, Rio de Janeiro, Karachi, Montreal, Mexico City, Rajkot, Bhopal, Santiago, Lahore, Ulsan, Chennai, Hanoi, Turkey, Sharjah, Vung Tau, Jeddah, Kuala Lumpur, Toronto, Nagpur, Thiruvananthapuram, Madrid, Perth, Milan, Singapore, Manama, Jaipur, Los Angeles, Geoje-si, Petaling Jaya, Pimpri-Chinchwad, Tehran, Edmonton, London, Bangkok, Haryana, Howrah, Thane, Visakhapatnam, Dammam, Dallas, Coimbatore, Courbevoie, New York, Cairo, Ahmedabad, Hong Kong, Abu Dhabi, Istanbul, Ernakulam, Lagos, Granada, Colombo, Vadodara, Navi Mumbai, Brisbane, Mumbai, Seoul, Hyderabad, Caracas, Bengaluru, Atyrau, Al Jubail, Ludhiana, Sydney, New Delhi, Baroda, Jamshedpur, Gurgaon, Muscat, Australia, Moscow, Ranchi, Calgary, Faridabad, Chiyoda, Indore, Gimhae-si, Kanpur, Jakarta, Kuwait City. Trinidad & Tobago,Tunisia, Turkey, Denmark, Switzerland, Romania, Iran, Oman, France, Canada, Sri Lanka, Singapore, Malaysia, Netherlands, Chile, Chile, Costa Rica, Bolivia, Ireland, Tibet, Libya, Kazakhstan, Argentina, Sweden, Thailand, Iran, United Arab Emirates, United Kingdom, Taiwan, Venezuela, Nepal, South Africa, China, Bahrain, Afghanistan, Zimbabwe, cyprus, Czech Republic, Ecuador, Gabon, Hungary, Belarus, Italy, Lebanon, Serbia, Nigeria, Spain, Saudi Arabia, Hong Kong, United States, Kuwait, Philippines, Mongolia, Macau, Morocco, Australia, mexico, srilanka, thailand, malaysia, Bulgaria, Namibia, Greece, brazil, Peru, Slovakia, Colombia, Jordan, India, Poland, Brazil, Croatia, Russia, Bhutan, South Korea, Mexico, Nigeria, Kenya, Estonia, Vietnam, Yemen, Algeria, Ghana, Norway, Ukraine, Mexico, Gambia, Qatar, Puerto Rico, Belgium, Germany, Poland, Austria, Egypt, Bangladesh, Lithuania, Azerbaijan, Finland, Israel, New Zealand, Portugal, Indonesia, Japan.